The Imaginarium is an exhibition co-curated by Tomorrow’s Thoughts Today and Studio Lukas Feireiss (editor of Beyond Architecture, Spacecraft and Architecture of Change etc) with Luis Berrios-Negron. The exhibition brings together a group of architects, artists and scientists including TTT’s Liam Young, Francois Roche/R&Sie(n), Greg Lynn, Philip Beesley, Rachel Armstrong, Theo Jansen, Terunobu Fujimori, Triptyque Architecture, Ilkka Halso, Lucy McRae, Cero9, Mas Yendo, and many more to engage the prescient subject of ecological change and adaptations caused by artificial interventions into existing ecosystems. botanical samples, exhibits, evidence and curiosities. Archived in the accompanying Catalogue of Speculative Specimens we see a jump in the fossil record, an evolutionary leap, as the interbreeding of biology and technology has given birth to a strange new nature. 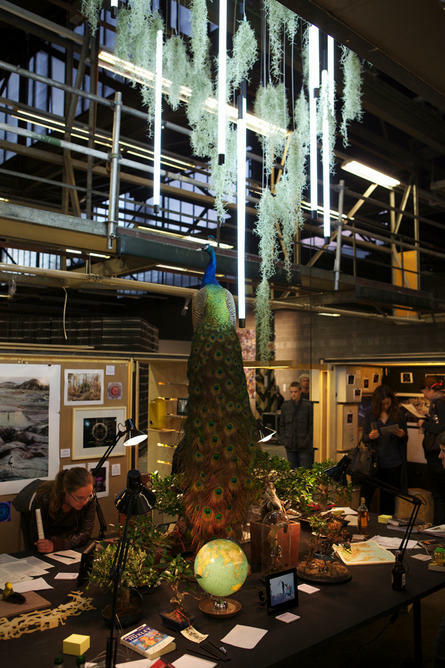 The Imaginarium forms part of the exhibition Examples to Follow: Expeditions in Aesthetics and Sustainability curated by Adrienne Gohler. and is open from 3.09.10 – 10.10.10 at the Uferhallen in Berlin. See more photos and videos below.